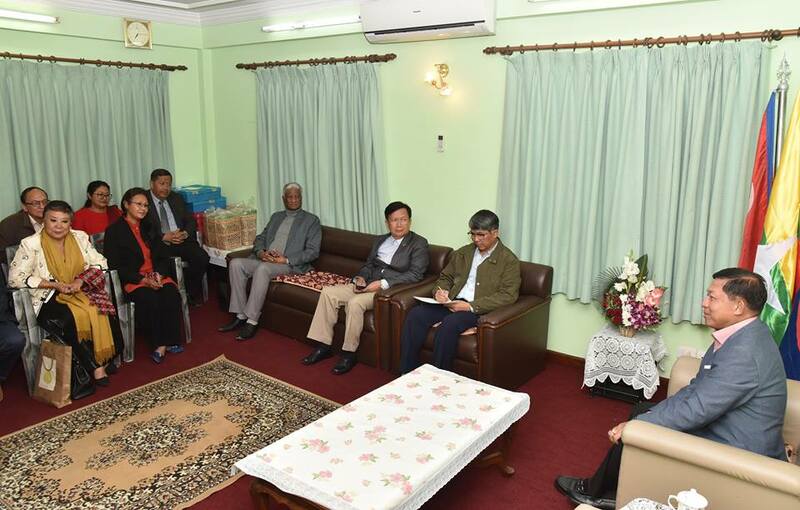 Commander-in-Chief of Defence Services Senior General Min Aung Hlaing who is on a goodwill visit to the Federal Democratic Republic of Nepal received officials of Nepal-Myanmar Friendship Council at the parlour of Myanmar Embassy to Nepal in Kathamandu on 12 December evening. At the meeting, the Senior General expressed his delightedness for meeting with the Nepal-Myanmar Friendship Council. He said his tour was to promote relations between the two armed forces and two countries. It was the first trip of the Chief of Tatmadaw of Myanmar as a historical trip during the 50-year period after Chairman of Revolutionary Council General Ne Win paid a goodwill visit to Nepal in 1966. Strengthening relations between the two armed forces contribute much to relations and friendly ties between the respective two countries. 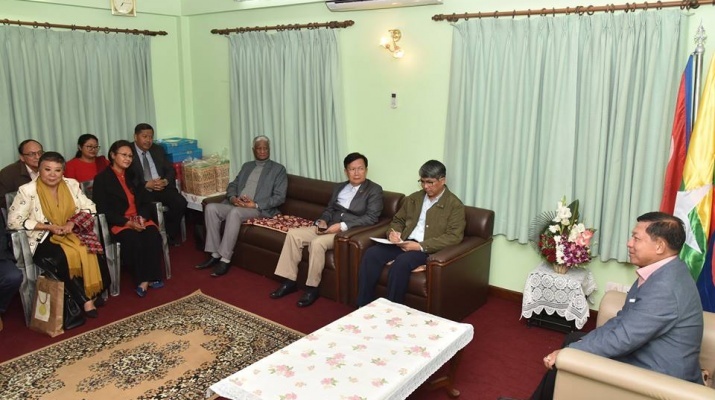 During his trip, the Senior General said he called on the President of Federal Democratic Republic of Nepal, the Prime Minister, the Minister of Defence and the Chief of Army Staff of Nepal. 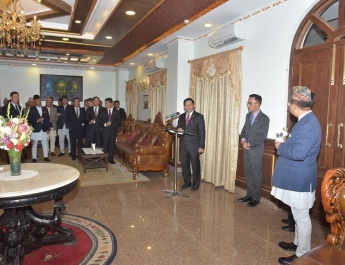 The government and leaders of the Nepalese Armed Forces warmly welcomed the Myanmar Tatmadaw goodwill delegation and heartily supported promotion of friendly relations between the two countries. 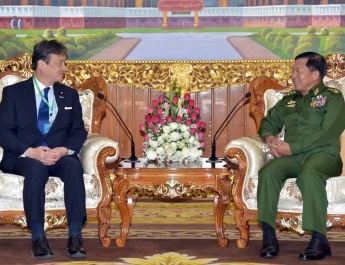 Next, the Senior General explained that as further plans based on results from the successful trip must be implemented, more cooperation will be promoted for goodwill delegations based on cooperation between the two armed forces and exchange of delegations in training, sports, cultural, medical and natural disaster affairs. Afterwards, the Senior General said that sound foundations have been laid in relations between the peoples of two countries. There are a large number of Nepalese people born in Myanmar residing in Nepal as well as many Nepalese people and their relatives living in Myanmar. It should not forget endeavours of Nepalese Myanmar Tatmadawmen in independence struggles of Myanmar and in the post-independence period of the nation. They loyally discharged duties with sacrifice of lives for Myanmar and the Tatmadaw, and some of them who were awarded gallantry medals including Aung San Thuria title which is the highest gallantry medal are described at the Memorial to Fallen Heroes. At present, many Nepalese officers and other ranks are discharging duty in the Tatmadaw. Then, the Senior General noted that many opportunities have been created for promoting economic and trade sectors including tourism industry based on sound foundation for friendly relations between the peoples of two countries so as to cement friendly ties between the two countries. As such, the Senior General stressed the need to strive for cooperation in economic sector. The Senior General pledged to help them develop social economic status of Nepal as much as he can and urged all to participate in it. He said he would like to give a message that his trip was a successful and historical one as a powerful step to strengthen friendly ties between the two countries. 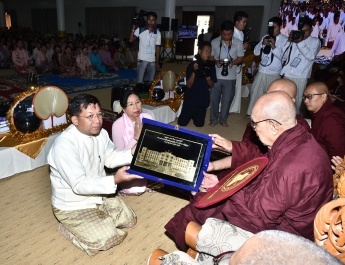 Later, the Senior General presented commemorative gifts to officials of the Nepal-Myanmar Friendship Council and posed for documentary photo together with them.